Good luck NASA! The Hubble is a fantastic piece of machinery that deserves to be kept functioning as long as possible. I look forward to updates! The 386 processor, produced since 1986. Hubble launched 1990.
Who uses a 20 year old computer nowdays ? Quad core, put 4 laptops on four wireless routers. I believe I read somewhere that the telescope is still able to perform valuable astrometry measurements while the other instruments are down. Among other things, Hubble astrometrics are used to help understand the nature and distribution of dark matter in the universe. From Bad Astronomy: The HST486 (replacement to the DF-224) computer that manages the spacecraft pointing control and other subsystem tasks safed, as it is supposed to do, the NSSC-1 (NASA Standard Spacecraft Computer 1) that normally interfaces with the science instruments, and then the SI’s themselves at 21:14 UT. The two computers “talk” to each other across what is known as a “Processor Interface Table”, or PIT. A continual “handshake” (PIT toggle) between the two computers is expected. If the DF-224 does not get that handshake it presumes the NSSC-1 may have a problem and, through a predefined sequence of inter-computer commands puts the NSSC-1, and then separately the HST Instruments into a “safe” configuration. Of course, then, the “stored command plan”, which was on a path for recovery to restart science, carried out by the NSSC-1, is suspended. What caused the loss of the PIT toggle? That is still under investigation. But, what is known is that the redundant “Command Unit/Science Data Formatter B”, part of the Command and Data Handling (C&DH) unit side A, that failed after 18 years is apparently fine. In fact, the NSSC-1 memory after it was safed was successfully dumped to the ground through CU/SDF-B. A preliminary analysis of that memory dump points to a “potential problem” (emphasis is on potential, as this is quite early in the investigation) in the Central Processor Module (CPM) on C&DH Side B. But unclear if that is a potential H/W, configuration (remember everything was just switched over to Side B with a lot of reconfiguring), or S/W “problem” – so I would not jump to any conclusions ahead of the good folks at Goddard looking at this carefully and methodically. In the short term… As the CPM is redundant – AND can be cross-strapped- (in a side A/B hybrid configuration) by ground command, Goddard is in the process of moving contingency operating procedures to affect that cross-strap using the high-fidelity Hubble simulator (the VEST “Vehicle Electrical and Test” facility). That may already have been done as I write this, and thus (presuming that ground test is successful, as I would expect it to be), the COP would be available to do the same on-orbit if further diagnostics and analysis indicate a side A/B hybrid would (for now) take care of the problem. The above is an “unofficial” explanatory status. Look to NASA for the official word. The mirror and mechanicals are still viable. A gift for the ages. A space age Stone Henge ? Sink a ship to make a Coral Reef. For a space history vacation. Hang in there, NASA. The Hubble project is the most-spectacular one in history, next to the 1969 moon landing. HST was built in the early 80s (and has many electronic parts from the 70s). It was to have been launched in 1986 right after the Challenger mission so it sat in storage for a few years. Although the first Pentium was released when the 486 was chosen as the replacement for the DF-224, there were no Pentiums qualified for radiation susceptibility at that time. Larian is correct – each subassembly within the SIC&DH has an A side and a B side and various combinations of A and B can be selected. A workable string will be determined (my prediction!) and HST will be back and running shortly. It seems to me that since Bush announced his change in priorities the support for Hubble is not as strong. We are now checking the edge of the solar system? Did voyger leave the solar system yet? I want to commend Kate Tobin for an excellent article about a technical subject. I remark about it because I don't expect this much actual information from CNN. The conversational tone (being a blog) and level of detail was just right. It gave me the information I wanted in an accessible way. I am familiar with spacecraft data systems design and how Goddard engineers work a problem, and this post conveyed it very well. HST is a treasure. I hope functionality can be restored, and HST can continue to help humanity discover the wonders of the universe. I really think it is funny how you modern day "techno snobs" (Franko) minimize the great scientific accomplishments of the past. You may be able to surf the web with your duo core processors, but I have not seen any of your generation walking on the moon yet. Even the Chinese are out stripping you guys in scientific knowledge. Keep on surfin' and gamin' DUDE. I'll say a prayer for NASA./Hubble....only a few more weeks and funding will increase for NASA....hang in there....it'll all work out. S Callahan; "I’ll say a prayer for NASA./Hubble"
Please be selective, and do the oppisite, not a prayer, but a curse ! "NASA Chief: Global Warming Treated Like a Religion"
"embroil my agency in a controversy in fight that we don't have a dog"
Carbon taxes, predicted to rise, drowning the world economy. Death by a thousand cuts, taxation version . 1/2 dead the goal ? Pray for NASA, and you are a part of the problem. To "its all a big lie." Are you really that small minded to believe that? Perhaps you are just uneducated and upset with your lot in life! So sad. Hubble has given us all a glimpse so far back in time and that is just a small portion of it's work so far. And no, I am not a space tech! There are two launchpads capable of launching the Orbiters. With Atlantis moving today, Nasa is reportedly beginning to alter one launchpad to handle the Constellation program. With only one launchpad for Orbiter missions, how can we return to the Hubble when Nasa requires another Orbiter to be ready to go? Are we really going back to the Hubble? NASA the Hubble is a fantastic piece of machinery that needs to be updated with new computer and soft ware then put back in orbit to continue the mission of looking to space. The Hubble launched 1990 that a long time ago. Keep up the good work. forward to updates! Simplicity at its best...they can and will fix it in February when the time comes. Even YOU could use a good "fixing". Think positive and keep your head screwed on tight good thing will happen to those who WANT it to happen. Even if the world comes to an end, we will all be fixed appropriately ...when that time comes as well. 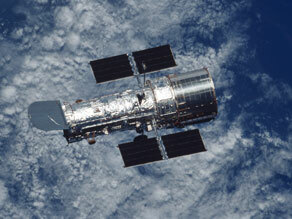 Keep the Hubble going until the new telescope is deployed in 2010!~ What a scientific treasure it has been! This news story contains a spelling error: "and it is far to soon to go there", should be "and it is far too soon to go there". The spelling error is now corrected. But on climate, you have to accept the NASA Dogma. Hence the secret, code word "dog"
People have to remember, money spent on space programs doesn't dissapear into space. It stays right here on Earth providing research and new technologies. Every time we plan a mission, we learn. That's what it's all about. Are you there ? Please Confirm. Definitely true about the "Os". What is their problem.? Here is hoping that Hubble gets a new lease on life. We have learned so much since it's inception The more we learn, the more we gain. Go NASA! Too bad the "Os" don't get it! I could say more but why bother. Some people just don't get it! I'm sure that is what you are hoping to retire on!!! R. Morton; "Some people just don’t get it! ... At all ! Good luck at Bingo!!! ? " As I look out, with my telescope to the Universe, the trailer window. Hubble and I, spy the same sky. Neither I, nor the Hubble, has yet, identified Niburu, coming in 2012. So I know. not only the year, but also,the hour, of the Nepharin. How about we all contribute a very small percentage of what we earn. In time it would add up so that we could afford to learn what we need to. It's a big universe out there. I'm keen. Let's do it. For lack of a better place to put my comment. i wanted to comment on the halogram presentation, very hopefull that technology can and will make a crucial difference in the future of the american economy. And needless to say that obama with his success via technology in this campaign will be the choice to encourage and support this drive. CNNs naming the effect a "hologram" is quite a laugh among us in the broadcast industry. It is nothing more than a "Key" with a mask that follows the fill item, and not very well at that. I assume that it was Wolf Blitzer, Part of the "best political team on television"
( Boy am I sick of hearing that every 2 minutes!) that came up with it. I hope some of you watched the excellent coverage provided by ABC,CBS,NBC,CBC and BBC. Wolf, let some of the hot air out of your head and give us all a break. You are not, and never will be Walter Cronkite. Sheesh! Even Jack Cafferty was embarrassed by your constant references to the best team slug. Go Jack! Carry on Wolf, but come down to earth, Please! Good luck to President elect Obama. I'm a Canadian, and the election was followed very closely among my friends up here in the colonies. ( CANADA) Also, good luck to the USA. The world needs you. RPM & Chester the dog!